On October 19th, 1986, early in the morning when I was at home I suddenly felt the same symptoms of pains as I had experienced before. I knew I was having another heart attack. This was my third heart attack. I told Lu Lu that I had to get to the hospital as quick as possible. I called my friend Douglas and told him about my symptoms. Within no time Douglas was at my apartment and drove me in his brand new Porsche to Alexandria Hospital. At the hospital they took a catheterization test and it showed a total blockage of one of the main arteries to the heart. The doctor told me that I needed a bypass right away as they couldn't take any chances of me having another heart attack which would weaken my heart even more. That same night I was flown by helicopter to Fairfax Hospital where the next day very early in the morning I would be operated on. I was very scared. All night I was kept awake for all the test procedures they had to do before I went into the operating room. Some of those testing procedures are very painful, and the agony of pains you have to go through make you get to the point where you say to yourself, please put me to sleep and get it all over with. As I was taken into the operating room I remember how rough this nurse was putting the IVs in my arms. It looked to me she didn't have any feelings or sympathy for the patients. Not even a kind word came out of her mouth. She must have prepared many patients for the operating room, and for her it was just a daily job to have another body ready to be operated. That's all I remembered before I went into the operating room. I remember the first time I awoke after the operation. A nurse was calling my name. I had tubes everywhere and I wished the nurse had kept me asleep. I was told that the operation had lasted for 6 1/2 hours due to a few complications during the operation. 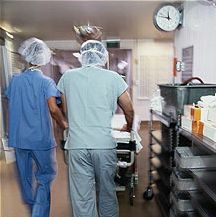 The pains and discomforts you have in the first few days of recuperation, you wished you had never had this operation. It's always a delight when you fall asleep because there are no pains and worries. My roommate in the hospital had the same operation and was ten years older than I. I felt ashamed to complain about anything with him around. My left leg was cut from the ankle to the groin as they had taken some arteries to replace in my chest. My leg was swollen and very painful but after the third day of my operation I slowly had to start walking. It was very painful just to stand on my leg but I did everything the doctor told me to do as I wanted to get out of the hospital as quick as I could. My roommate and I were operated on the same day. Both of us were getting plenty of pills and food but we didn't have any bowel movements at all for several days already after our operation. To try to get your normal bowel movement again is one of the most painful experiences I had in the hospital. You have just been operated on and your whole body hurts. I spent hours in the men's room because of the embarrassing situation by trying to help yourself. After many hours of trying I became so disgusted that I came to the point where I couldn't care less what they were going to do with me. I told the nurse to call the doctor and get me out of this misery. When the doctor came in to see me he told the nurse to prepare me for a laxative injection. I was stripped completely naked and a plastic cover was put on top of my bed, and the tubes they use are no fun to look at. The doctor and the nurse were very helpful but the procedure was so painful and embarrassing that for two days I didn't feel like eating at all. I was much luckier than my roommate as during the same procedure he developed a hemorrhoid and needed to be operated. During my stay in the hospital the nurses were very kind and patient. They even remembered my 23rd wedding anniversary (October 24) and surprised Lu Lu and me with a nice cake and flowers. After a ten day stay I was released to go home. My leg was so swollen I could hardly walk, but I was told the swelling would slowly disappear by walking on it every day. A friend of mine came to the hospital to take me home. Our apartment is on the third floor without an elevator so I had to walk up the steps. Thanks to Fred, the building janitor who is a very strong man, I was able to lean on him and slowly make my way up to the third floor.